I’ve just re-covered Scent of the Böggel-Mann – yes, me – and I’m told it’s not half bad. But why did I take time out from writing to produce my own cover? Cost. Scent of the Böggel-Mann is a story of 10,000 words – about a tenth the length of each of my Torc of Moonlight novels. It retails at 99p / 99c and I gain in royalty 29p / 33c per sale. Bespoke ebook covers can cost $300 upwards. You don’t need to be a mathematician to work out how many sales are needed to recoup the outlay and, unless you are a bestselling ‘name’, the time it will take to gain those sales. Two or three days spent watching YouTube how-to videos and experimenting with image manipulation software begins to look cost effective – IF thought is given to the design. The primary goal of a book cover is to entice its target readership to click for more information. The target readership in this case are those people who read Horror, so my first stop was the Amazon bestseller list for that genre to understand the ‘look’ of the genre. At first glance, which is how long a trawling buyer may focus on a cover, there’s a lot of monochrome and most of it is dark in tone using plenty of contrast. Armed with that information I started to seek similar images. I have an account with Depositphotos, picked up during a sale, but I also keep my eye on Pixabay, a site of free-to-use images, and Creative Commons images. Be certain about the licensing conditions offered; not all will include commercial use. The story centres on a locked shipping trunk gained at an auction by a young-woman-next-door female. I discounted having an image of a woman on the cover. If she was neither a terrified victim nor somehow possessed of evil her ordinariness alone would run counter to the look of the genre. Give readers no reasons to reject investigating further. I found an image of the sort of trunk described in the story, but I couldn’t find a suitable background. Besides, let’s face facts here, the skills needed to competently mesh the two are beyond me at the moment. Then I read an article about the folly of ‘telling the story’ on a cover. What I needed was to indicate the tone of the story, not the story itself. Back to hunting images. 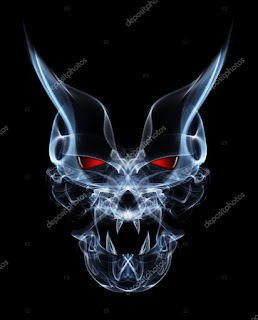 First I came up with the smokey skull, but felt it was a bit bare. I searched for more smoke effects and found a couple using the same colours. 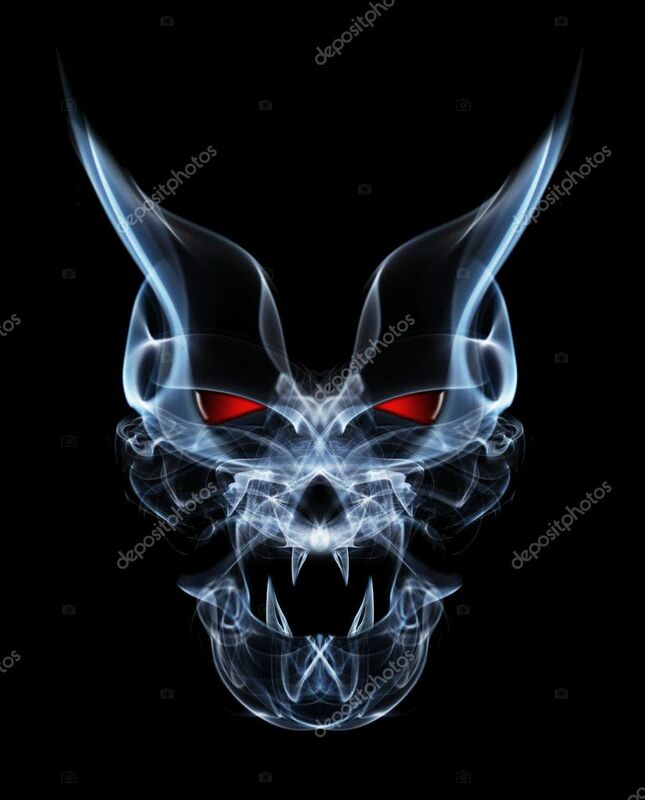 I particularly liked the red eyes of the smoke-skull. It’s not a frightening image, as in portraying oodles of gore, but a quietly sinister image which fits with the tone of the story – my writing is more Stephen King than Richard Laymon. 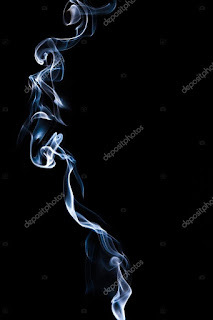 And there’s a skull in the story, and smoke, so despite not wanting the cover to ‘tell the story’, it does tick a couple of story boxes. As I couldn’t find anything better, I made my choice. Note: the images have a watermark enabling test downloads so mock-ups can be produced before purchasing, which is most useful when you are paying by the image. I decided to stick with the black background – it’s both easier and gives the required contrast – but moved both images about the cover-space in search of a placing to catch the eye. Typefaces and fonts are a world unto themselves and the choice is ridiculously wide. For instance, a thin curly font is beloved by Chicklit, part of its genre look along with pastel colours and hand-drawn imagery, but what did I need for Horror? Again I went back to studying the Amazon bestseller lists and trawling YouTube. On YouTube I came across Derek Murphy’s collection of how-to videos. The one I’ve linked to I found particularly useful because he explains what he’s doing and why he’s doing it, and the video and narration show there’s a great amount of trial and error involved – a learning curve that resonates with me. He may be using an updated version of Photoshop, but the concepts can be transferred to whichever software is available. Checking back with the Amazon Horror list, I began to understand the virtuous circle of Title, Authorname and Logline or Review Quote, as well as serif/sans serif choices, and selecting colours from the image’s palate. The red of the smoke-skull’s eye which had drawn me originally would be my colour of choice for the Title; the blue of the smoke my choice for my Authorname and a Logline. I wouldn’t have thought of using a Logline at all, despite these being carried by many book covers in the Bestseller list, yet it is an instant way of giving an indication of the story. I also chose a calm sans serif font for Authorname and Logline, and a busier font for the title. Whether my choice of font for the Title is the best, or even reasonable, remains to be seen. It is readable, even as red-on-black at the thumbnail size used by Amazon. The fact that the Authorname and Logline can’t be read at thumbnail is neither here nor there; at thumbnail it is the look that counts the most. Get a reader to click on the image link and they can be read on its page. After that it’s up to the blurb – the product description – to make the sale. Sometimes, it’s the cover alone that does that. With the cover complete, I created a complementary visual for use on social media sites using the images already purchased in a slightly different way. Expensive image manipulation software is not necessary to produce reasonable book covers. For free try Canva, which has an ebook template. Or try out Derek Murphy’s own semi-completed online cover creator on his DIYBookCovers website. If you do wish to purchase software, take a look at Serif’s Affinity retailing at less than £50. There are lots of tutorials on its site, and user videos on YouTube. Keep a note of all settings used in creating a cover, from the source and identity code of the images, to the font and HEX number of colours used in the text. It’s surprising how often I need to refer to the information. Here it is at last: the new cover for my stand-alone short, Scent of the Böggel-Mann. Some lots are best left in the auction room. 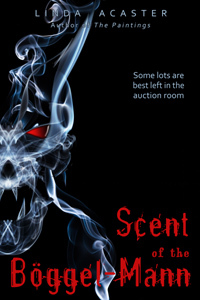 Elaine haunts auctions held in crumbling country mansions, dreaming of a find to make her and Gary rich. A plain wooden shipping trunk has no key to its iron-banded locks but is far heavier than it should be. What might it contain? Mainstream publishers regularly change the covers of their titles: to re-brand the author, or a series, or to edge the title further into its genre ‘look’. Scent of the Böggel-Mann is aligned with the Horror genre, but you’d picked up that already, right? With a cover like this it couldn’t be Chicklit, could it? And that’s how covers work. They act as fast tags to the type of story to be found within. 'A picture paints a thousand words', and all that. The title is on wide distribution at an entry level price of 99p/99c, available from Kindle, Kobo, iBooks, Nook, and Smashwords for all formats. Join me next time, when I’ll be talking about the whys and the hows of creating a cover. I’ve recently read two ‘faction’ works, and I enjoyed both. The first was a novella, All The Freshness Of The Morning by David Black, the second full-length, The Secret Life Of The Elephant Man, by Milford Grove. 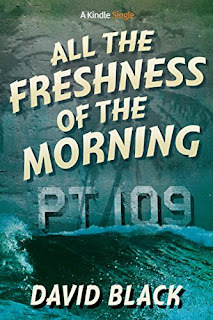 All The Freshness Of The Morning is a dramatisation of the time spent in the Pacific during WW2 of a young Lieutenant Jack Kennedy – later known to history as the United States President John F Kennedy. 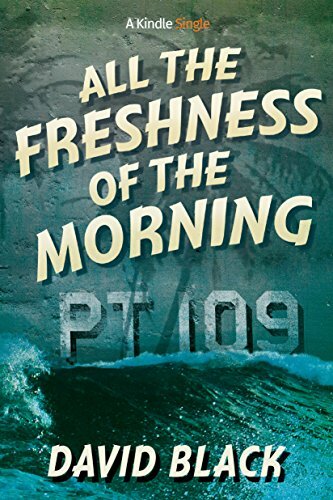 It is written in an accessible, chatty style, conveyed by a fictitious narrator years later remembering his time aboard the same PT boat. 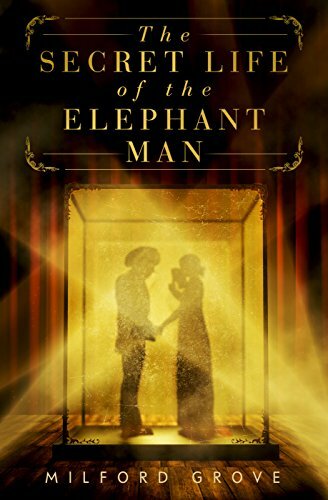 In contrast, The Secret Life Of The Elephant Man takes the progressively deforming Joseph Merrick from his birth in Leicester to his death in the London Hospital in 1890. Although Merrick is the focus, and the story is conveyed from his viewpoint and that of his contemporaries, the book explores Victorian attitudes to the vulnerable, therefore deftly mirroring attitudes prevalent today. ‘Faction’ is the art of fictionalising recorded facts about real people, usually now dead, to give an insight into their life and times, written in such a way as to challenge the reader to discern the fact from the fiction. This is why it’s a genre I’ve shied away from. No matter the amount of research undertaken, no writer is ever going to get the detail correct. As if to underline this, both works mentioned above state that they are a work of fiction based on historical fact. They have, however, made me muse on the way I do write history. For Hostage of the Heart the big picture, the events of the latter part of 1066, were researched, as was the life of ordinary people – the primary pull of history for me – yet no character existed in history. Does this make it less of a story, less of a truth? For Beneath The Shining Mountains I also concentrated on the life of the Apsaroke people of the American northern plains. Its pre-European expansion backdrop I knew a great deal about as for many years I’d been a re-enactor giving talks to schools and community groups. Did these people live and breathe? Yes, but not under the names or settings depicted. Each novel in the supernatural Torc of Moonlight trilogy has a different historical thread which resonates with the main contemporary timeline. Binding the two are the real-life settings which were researched down to the colour of the paint on a door. In all, anachronisms were scrubbed spotless, yet in each the depth of history portrayed varied. Do I still believe I made a decent fist of writing the history? Yes. So why am I now musing on the different forms of conveying it? This year I discovered information about my grandmother’s life at the close of WW1, a piece of jigsaw that has unexpectedly connected family hearsay. I want to portray her story in fiction, yet I have little more than a few black and white photographs of her in later years and a couple of bald census pages. I could certainly conjure a historical novel, though it would deviate from her day-to-day trials. Could I write faction? I’m not sure I have enough to make a choice. Maybe when I start researching the period and the places, she’ll tell me.